This free website evaluation steps you through a simple, non-geek appraisal of your website’s sales-effectiveness. Do it now. Our blogscontains SEM and SEO tips; advice and industry updates. I try to make them non-technical so business people can action much of the info themselves. Subscribe for free using the form on the right. I was quite amazed that there is so much you can do to increase the chance of people finding your website! Karen. Copywriter. 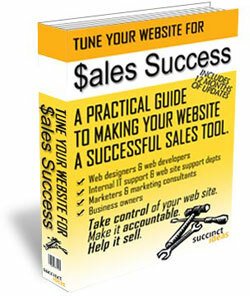 Tune your website for sales success is more than just an internet marketing reference. This 100+ page ebook contains the why’s and how’s of internet marketing. Its in simple plain-speak English. You don’t have to be a geek to read & use it. Find out exactly what you need to do to your website, then how to do it. DIY your own internet marketing & save! If you would like a copy, request it via our contact form and I’ll email a personal copy to you for free!